Contents: Introduction, Anne Humpherys and Louis James; Part I Beginnings: France: G.W.M. Reynolds and the modern literature of France, Sara James; The French connection: G.W.M. Reynolds and the outlaw Robert Macaire, Rohan McWilliam. 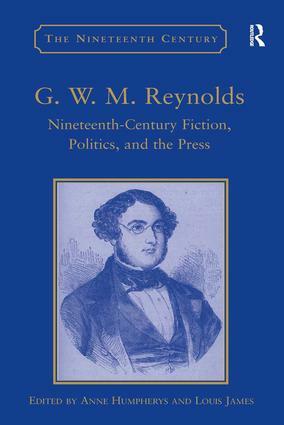 Part II Politics and the Periodical Press: Reynolds's Miscellany, 1846-1849: advertising networks and politics, Andrew King; G.W.M. Reynolds, Reynolds's Newspaper and popular politics, Michael H. Shirley; From journalism and fiction into politics, Michael Diamond; 'Some little or contemptible war upon her hands': Reynolds's Newspaper and empire, Anthony Taylor. Part III The Urban Mysteries: An introduction to G.W.M. Reynolds's 'encyclopedia of tales', Anne Humpherys; Lost in translation: the relationship between Eugène Sue's Les Mystères de Paris and G.W.M.Reynolds's The Mysteries of London, Berry Chevasco; The wrongs and crimes of the poor: the urban underworld of The Mysteries of London in context, Stephen James Carver; Reynolds's Mysteries and popular culture, Juliet John. Part IV Popular Culture: Time, politics and the symbolic imagination in Reynolds's social melodrama, Louis James; Reynolds's 'memoirs' series and 'the literature of the kitchen', Graham Law; The virtue of illegitimacy: inheritance and belonging in The Dark Woman and Mary Price, Ellen Bayuk Rosenman; The mysteries of reading: text and illustration in the fiction of G.W.M. Reynolds, Brian Maidment. Part V Afterlife: G.W.M. Reynolds: rewritten in 19th-century Bengal, Sucheta Bhattacharya; Modernity, memory and myth: Reynolds's News and the cooperative movement, Ian Haywood; A bibliography of works by G.W.M. Reynolds, Louis James; Bibliography of selected secondary materials on G.W.M Reynolds and his works, Helen Hauser; Index. Anne Humpherys is Professor of English at Lehman College and the Graduate Center, City University of New York, USA, and Professor Louis James is Emeritus Professor in Victorian and Modern Literature at the University of Kent, UK.